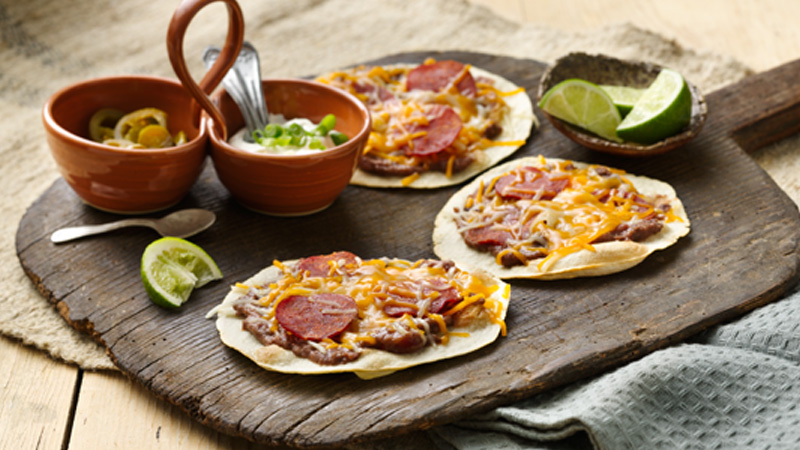 Try this new twist on pizza; tortillas are a perfect way to make a quick pizza that kids and adults alike will love! 1. Preheat the oven to 220 ºC (200 ºC for fan assisted ovens), gas mark 7. Grease 2 baking sheets with cooking spray or oil. 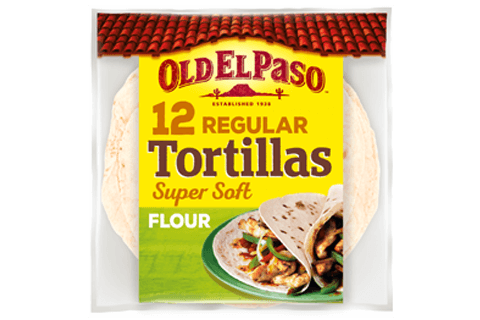 Spray or brush both sides of each tortilla and place onto the baking sheets. Cook in the oven for 3 minutes or until the bottoms become slightly crisp. Turn the tortillas over and continue to cook for 2-3 minutes or until the bottoms are slightly crisp (tortillas will continue to crisp upon cooling). Remove the tortillas to a cooling rack and let cool. Reduce the oven temperature to 180 ºC (160 ºC for fan assisted ovens), gas mark 4. 2. Meanwhile, mix together the refried beans, salsa and chipotle sauce in a medium bowl. 3. Spread the refried bean mixture (about 3 tablespoons) on each cooled tortilla, leaving a 1-2 cm edge. Top with pepperoni slices (3 per tortilla) and cheese. 4. Cook the tortillas in the oven for 6-7 minutes or until heated through and cheese is melted. Cut into wedges. Great also served with jalapeños and soured cream. Double the fun! Stack 2 pizzas on top of one another before baking the second time, and bake 8 to 9 minutes, for really unique pizzas!